This April for National Poetry Month and in the spirit of Rainer Maria Rilke’s iconic book, Letters to a Young Poet, the Academy of American Poets will encourage students throughout the United States to engage with poetry by handwriting letters to the distinguished poets serving on the Academy’s Board of Chancellors. Selected letters submitted to the Dear Poet Project will receive a reply from the poet and will be displayed on Poets.org, the Academy’s popular website. The Academy of American Poets created National Poetry Month in April 1996, and today it is the largest literary celebration in the world, reaching over 10 million Americans. Throughout National Poetry Month, the Academy will be celebrating the important role that letter writing has played in the lives of poets. 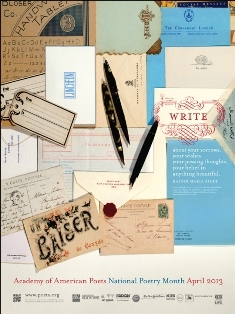 Poets.org will feature correspondence between poets, epistolary poems, and interviews with poets discussing letters they treasure. On social media, the Academy will continue its 30 Days, 30 Poets project tradition by showcasing thirty days of illustrated postcards from contemporary poets, each offering a line of advice for young writers. The letter writing theme is also reflected on this year’s National Poetry Month poster, which the Academy will distribute free-of-charge to 160,000 schools, libraries, bookstores, and community centers throughout the nation. The renowned graphic designer Chip Kidd selects a different artist to create the poster each year. This year’s poster was designed by Jessica Helfand of Winterhouse Studio. In addition to the new content features on Poets.org, the Academy offers a variety of resources for local event planners, including a search-by-state National Poetry Calendar where planners can submit poetry event listings for free. Every year, millions of people throughout the United States participate in National Poetry Month by hosting poetry-related events, particularly on Poem in Your Pocket Day (April 18, 2013). Poem in Your Pocket Day was initiated by the Department of Cultural Affairs in New York City and made national by the efforts of the Academy of American Poets. On that day, people throughout the United States carry poems in their pockets and share them with others. For National Poetry Month resources and events, including Poetry & the Creative Mind, the Academy’s star-studded gala at Lincoln Center, please visit National Poetry Month on the Web. National Poetry Month is made possible by the following partners: Alfred A. Knopf, American Booksellers Association, American Library Association, American Poetry Review, BOA Editions, Bright Hill Press, City Lights, Copper Canyon Press, Dixon Ticonderoga, EBSCO, Farrar, Straus & Giroux, Four Way Books, Graywolf Press, Hanging Loose Press, Houghton Mifflin Harcourt, Library of America, Louisiana State University Press, Merriam-Webster, Milkweed Editions, Modern Language Association, Mrs. Dalloways, National Council of Teachers of English, National Endowment for the Arts, New Directions, New Issues Poetry & Prose, Penguin Books, Persea Books, Poets & Writers, Poetry Foundation, Princeton University Press, Random House, Red Hen Press, Robinson Jeffers Tor House Foundation, Sarabande, Scholastic, Stadler Center for Poetry, The New York Times, University of Pittsburgh, W.W. Norton & Company, Wake Forest University Press, and Wesleyan University Press. The Academy of American Poets is the largest membership-based nonprofit organization fostering an appreciation for contemporary poetry and supporting American poets. 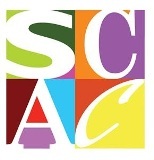 For over three generations, the Academy has connected millions of people to great poetry through programs such as National Poetry Month, the largest literary celebration in the world; Poets.org, the Academy’s popular website; American Poet, a biannual literary journal; and an annual series of poetry readings and special events. In addition, since its founding in 1934, the Academy has awarded more money to poets than any other organization. For more information, visit: www.poets.org. For interview opportunities and further information, contact: Stacy Lasner, 212-274-0343 x22, slasner@poets.org.